The most commonly used test is measurement of IgG in foals, llamas and calves for failure of transfer of passive immunity. There are many different immunodeficient states that have been reported in animals. Some are inherited, , e.g. severe combined immunodeficiency in Basset Hounds and Arabian or Arabian cross horses, whereas others are acquired, e.g. selective IgM deficiency in horses with lymphoma. Monoclonal gammopathies are a group of disorders that are characterized by the clonal proliferation of B-lymphocytes. These cells secrete large amounts of a single immunoglobulin, which can result in clinical signs of excessive bleeding, renal failure and hyperviscosity. In dogs, monoclonal gammopathies occur typically with lymphoid neoplasia, especially multiple myeloma, chronic lymphocytic leukemia and lymphoma. In addition, monoclonal gammopathies can be idiopathic or occur secondary to canine Ehrlichiosis, Leishmania infection, or chronic pyoderma. In most of these reactive plasma cell proliferations, the monoclonal immunoglobulin is IgG, whereas IgG, IgM or IgA can comprise the monoclonal protein in the neoplastic conditions. Therefore, quantification of the immunoglobulin class in a documented monoclonal gammopathy (by serum protein electrophoresis) may be helpful for the differential diagnosis of these conditions. In neoplastic conditions such as lymphoma and multiple myeloma, excessive amounts of a single immunoglobulin are produced. The type of immunoglobulin involved can be determined by quantifying the different immunoglobulins using radial immunodiffusion (see below). Therefore, RID should only be performed after a monoclonal gammopathy has been confirmed on serum protein electrophoresis. Bone marrow cytology in a dog with multiple myeloma. There are large numbers of plasma cells (*) in the aspirate, some of which are binucleate. 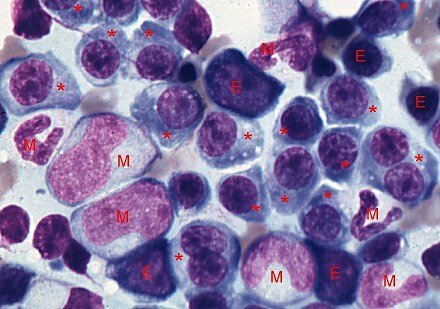 Hematopoietic cells (both myeloid [M] and erythroid [E]) are found in normal numbers and maturation sequence. In the past, immunoelectrophoresis was used to detect the immunoglobulin class, however this test is qualitative, insensitive, and cumbersome. It has been replaced by immunoglobulin quantification by single radial immunodiffusion (RID), which we use here at Cornell University. In this technique, agarose gel is impregnated with antibody against the species-specific immunoglobulin. The patient's serum is placed in a well and diffuses through the gel. When a zone of antibody-antigen equivalence is reached, a precipitin ring forms. This takes up to 48 hours to occur. The width of the ring is compared to a standard curve run on the same gel and is converted into a immunoglobulin value in mg/dL. It must be noted that in monoclonal gammopathies, that the provided result for the monoclonal immunoglobulin is semi-quantitative. Because these proteins are abnormal, an exact quantification cannot be provided. In these situations, we use a combination of the RID result with the electrophoresis to give an indication of the amount of paraprotein. It is important to know that there are different sources of these RID kits. The immunoglobulin results cannot be compared between kits, due to the use of different standards. Therefore, it is essential to use the same laboratory for immunoglobulin measurement and to interpret the results in relation to the laboratory's reference ranges. Comparing the immunoglobulin results of the same animal from different laboratories using different kits is invalid. We currently offer immunoglobulin quantification in dogs, cats, horses, cattle and llamas (for the latter , IgG only). We have established our own reference intervals for dogs and cats, using RID kits from VMRD or Triple J Farms. These are valid for adult animals only (growing animals usually have lower immunoglobulins and if a young animal is being tested, several age-matched control animals should be submitted concurrently). Our reference intervals for other species are provided by the manufacturer and are age-dependent, therefore it is imperative to provide an age when submitting these samples.